The activities of state governments have always been important in the American federal system. However, recent partisan gridlock in Washington, DC has placed states at the forefront of policymaking as the national government maintains the status quo. Pennsylvania Politics and Policy, Volume 1 is designed to showcase current issues of interest to Pennsylvanians. This reader contains updated chapters from recent issues of Commonwealth: A Journal of Pennsylvania Politics and Policy on education, health care, public finance, tax policy, environmental policy, alcohol policy and more. Each chapter is supplemented by forums with arguments in support of or opposed to contested elements of state policy, discussion questions, and suggestions for further reading. 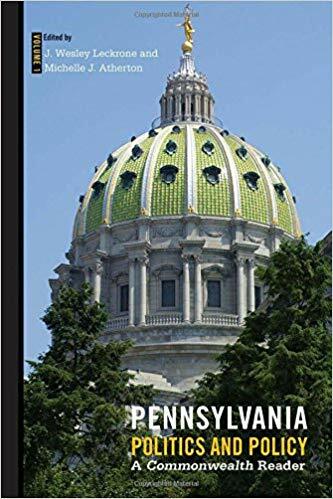 In addition, Pennsylvania Politics and Policy, Volume 1 includes a comprehensive guide to researching state government and policy online. It is designed as a text or supplement for college or advanced high school classes in American government, state and local politics, public policy, and public administration.